This page last revised September 20, 2015. Just when you thought HostGator’s Flash Sales couldn’t get any better, they went and added domain names to the mix! The End-of-Summer Flash Sales are nearly done. But you still have time to SAVE BIG with 60% off one-year of .com and .net domain registrations, and all new web hosting orders including WordPress hosting. But you’ll need to make your purchase today as this 3-hour flash sale will not be extended. Use promo code SEPTQUICK when placing your order. Sale Begins: Sunday, September 20th at 7:00 PM CST. Sale Ends: Sunday, September 20th at 9:59 PM CST. 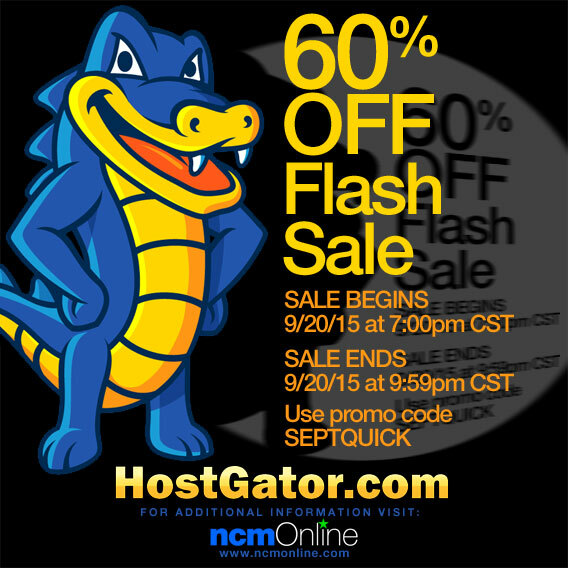 HostGator’s most extensive flash sales of the summer are drawing to a close. It’s time to take advantage of the 60% discount while it lasts. This sale will only run for three hours, so you’ll need to act quickly to save big.